As a matter of pride for Marine Solutions, Ferretti Custom Line 112 was awarded The Best Mega Yacht (Over 100ft) at the Indian Boating Awards. Also, Ferretti Yachts received nominations in five categories, Pershing in two and Sea Ray in one. Gautama Dutta, Executive Director, Marine Solutions, accepted the award on behalf of Ferretti Custom Line. 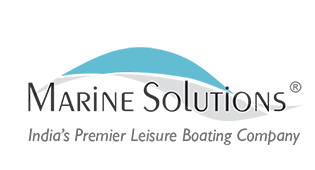 Marine Solutions was recognized for Best Yacht Management for 2008 at the inaugural Indian Boating Awards, which were held on December 14, 2008, in conjunction with the Boat India show in Cochin, India. 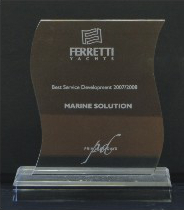 Marine Solutions was awarded the Best Service Development award for setting up Exclusive Ferretti Yacht Service Centers in India for Ferretti Yacht owners. Anyone who chooses a Ferretti Group yacht can rely superb after-sales assistance, service and benefits. 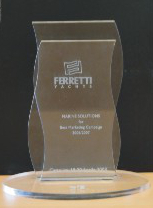 Marine Solutions was awarded the Best Marketing Campaign award for the year 2006 – 2007 by Ferretti Yachts for executing exceptionally creative marketing campaigns in India.